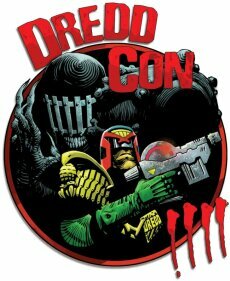 2000 AD ANNOUNCES DREDDCON 4! 2000 AD announced today that Dreddcon 4 has been confirmed for Saturday 6 December, and will be held among the gleaming spires of Oxford at the Oxford Union Society (St. Michael's Street, Oxford). Dreddcon 4 will open at 10am, and run until 5.30pm, and the Union Bar - with selected drinks at a very reasonable £1 per pint (woo-hoo!) - will stay open until 11pm. The entrance fee for Dreddcon 4 will be £2.50 per ticket, and this will gain you entry to everything that happens during the day. Dreddcon 4 will be packed with plenty to interest 2000 AD fans, including as many talks and panels featuring 2000 AD editors and creators as we can cram in, plus signings and sketching sessions and of course the perennial portfolio sessions and Tharg's Pitchfest. There will be a dealer room, featuring an official 2000 AD merchandise stand and a number of third party dealers, and an artists area, where a number of 2000 AD artists will be sketching and selling original artwork. We have already confirmed that Big Finish (2000 AD audio dramas) and Mongoose Publishing (Dredd and Slaine RPGs) will be attending Dreddcon 4, and we should be able to confirm appearances and demonstrations from other companies producing 2000 AD licensed materials shortly. The Union will be providing buffet food during the day and cooked food in the evening, and we are planning to have videos and music in the bar area after the events have concluded.